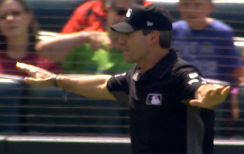 Replay Review, Crew Chief Angel Hernandez, an umpire-style blooper, incorrect TV commercial timing, and seemingly incorrect call (post-replay): a perfect storm of curiosities that came together to deliver an odd sequence in Seattle on Sunday. Servais appears amused by Hernandez's flub. With two out and the bases loaded during the June 25 Astros-Mariners game, Mariners batter Robinson Cano hit a 1-1 fastball from Astros pitcher Francis Martes on a line drive to center fielder Jake Marisnik, who threw to shortstop Carlos Correa to catcher Evan Gattis as Mariners baserunner R1 Mitch Haniger attempted to score, ruled out by HP Umpire Lance Barksdale. As replays seem to indicate Haniger touched home plate before Gattis tagged him, Mariners Manager Scott Servais filed a Manager's Challenge and sent the play to review. Blooper One: The broadcast had already commenced the inning break and gone to commercial as Hernandez and Barksdale donned the replay headsets. Regulations state the inning break should not begin until the Replay Review process is complete. Blooper Two: With the Replay Review procedure beginning at the start of the inning break, and concluding over 30 seconds after returning from commercial, the Replay Official exceeded MLB's two-minute review time limit regulation, which is a new-for-2017 feature. Caught in the Act: Angel signals Haniger safe. Blooper Three: After the decision has been made, Hernandez signals the runner safe, eliciting cheers from the Safeco Field crowd. Barksdale quickly alerts his crew chief to something, and Hernandez changes the call to "out." Due to the initial "safe" call however, Astros Manager AJ Hinch walks to the mound and makes a pitching change. 3B Umpire Mark Ripperger had held Hinch at the foul line during the review, but, given its initial "safe" outcome, released him to the mound. Odd Game Management? 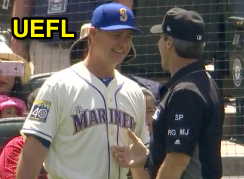 Seattle skipper Servais leaves the dugout to meet Hernandez, and appears fairly amused by Angel deploying an arms-extended "safe" mechanic before changing to a fist. 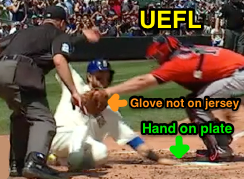 What could have been a contentious argument—due to runner Haniger appearing to have been safe at home plate—turned into an Angel Hernandez mea (Ron) culpa due to the wrong hand signal. Lost in the shuffle was the actual decision of whether the runner was out or safe: the humor of Hernandez's mistake appeared to trump the correctness of the actual call. The runner appeared to have been safe. The Seattle broadcast summed it up best: "Are they ruling Robbie out? ... Why?" before having a laugh. History: In 2014, Larry Vanover's crew—including Angel Hernandez—reversed an on-field "safe" ruling by Vanover to declare baserunner R3 Salvador Perez out for failing to timely tag up on a caught fly ball. Because the play was not reviewable at the time of its occurrence, some speculated that Vanover's crew consulted scoreboard video screens at Kauffman Stadium to help with the decision. This, naturally, is not allowed, but if Hernandez in Seattle had seen replays on Safeco Field's video board, he may have signaled safe to correspond with what he personally saw on replay. Video via "Read More"